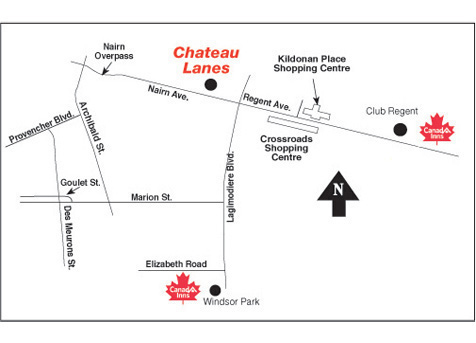 Map for hotels and centre. Tune in to watch the stepladder finals. 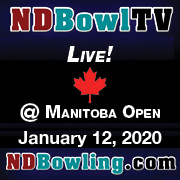 The Manitoba Open is a 2 Day Scratch Bowling Tournament. Day 1 is a 10 game qualifying round. 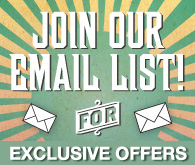 A Perfect Game Prize is offered for Saturday Only. Maximum entries allowed is 120. Saturday's scores Do Not carry over to Sunday. Day 2 is Match play (20-10-0). If cut is 30 - 9 Games of Match play, Game 10 is a position round. If cut is 24 - 7 Games of Match play, Game 8 is a position round. If cut is 16  7 Games of Match play, Game 8 is a position round. Top 5 advance to Stepladder Final. This tournament is sanctioned by CTF. 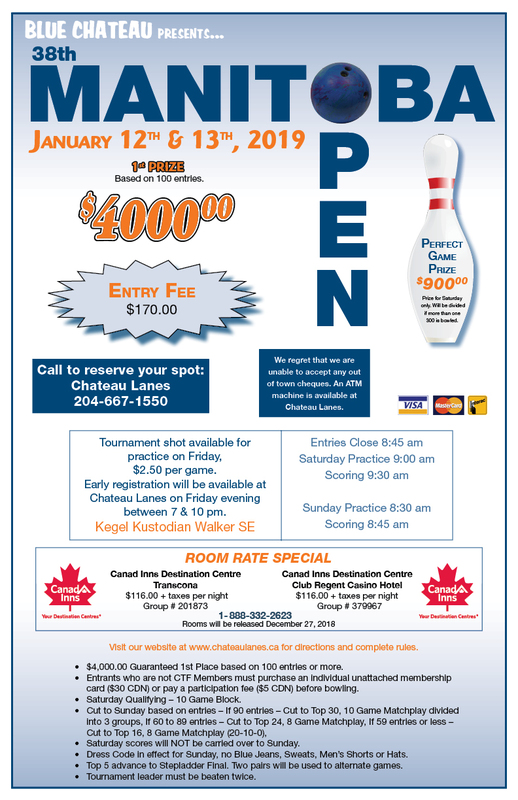 Entrants who are not CTF members must purchase an individual unattached membership card ($30 CDN) or pay a participation fee ($5 CDN) before bowling. Entries close at 8:45 am Saturday, January 10, 2015. The qualifying round on Saturday will consist of one 10 game block, moving lanes after each game. If 90 entries or more, the top 30 will advance, if 60 to 89 entries, the top 24 will advance, if 59 entries or less, the top 16 will advance to Sunday. In case of a tie for last qualifying spot after Saturday there will be a one game roll-off to break the tie. All qualifiers will be starting the match play even. Saturday’s scores will NOT be carried over. In match play on Sunday, bowlers will receive 20 bonus pins for a win and 10 bonus pins for a tie, with scores accumulating until the stepladder final. Dress code in effect for Sunday’s match play. No blue jeans, sweats, men’s shorts or hats. Tournament leader must be beaten twice in the stepladder. The 30 qualifiers will bowl 9 games of match play in 3 divisions. Game 10 will be a position round of all 30 bowlers with the top 5 advancing to the stepladder final. The 24 qualifiers will bowl 7 games of match play in 3 divisions. Game 8 will be a position round of all 24 bowlers with the top 5 advancing to the stepladder final. The 16 qualifiers will bowl 7 games of match play in 2 divisions, Game 8 will be a position round of all 16 bowlers with the top 5 advancing to the stepladder final.